• While Medtronic had many of the capabilities needed to develop and scale up Shruti iHear, it needed external partners locally to develop a ground level innovation: Once Medtronic licensed the technology from Chaturvedi, it was clear that this large company, will have to go beyond traditional product development capabilities (for Shruti program product) to innovate and to scale. Medtronic did have the capabilities and experience to complete product development and manufacture the otoscope, as well as the capital to finance the scaling process. However, it lacked start-up innovation culture to build the software component required for data collection. 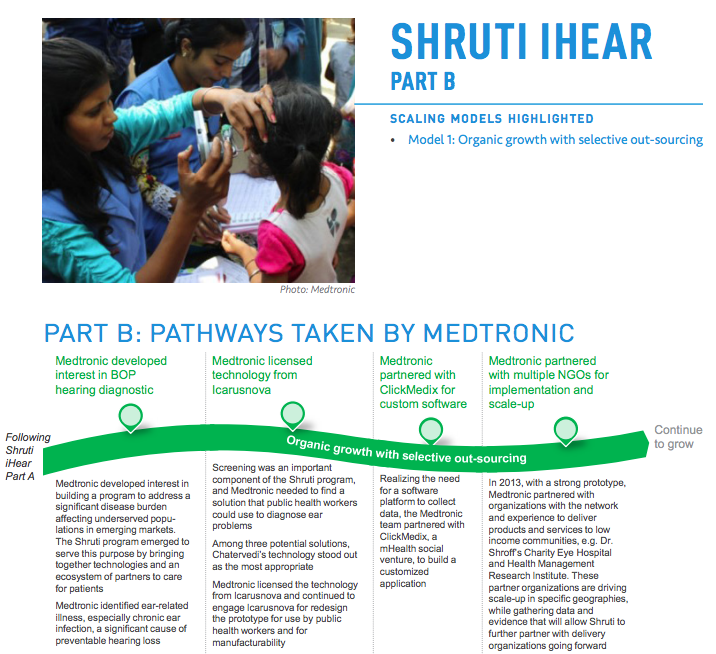 Additionally, the target users and beneficiaries of Shruti iHear are very different from Medtronic’s typical customers, so the company needed to identify ground-up methods to develop the social business ecosystem. 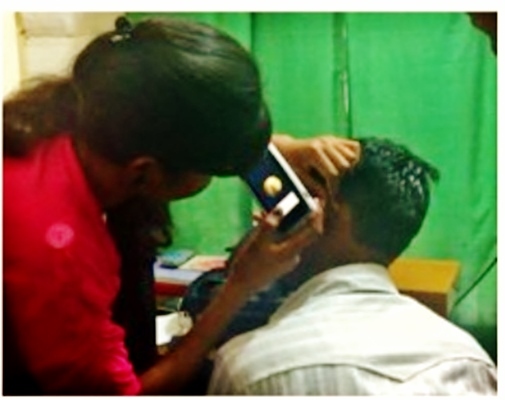 • Medtronic wanted to manage the ecosystem but limit on-the-ground presence: For strategic reasons, Medtronic wanted to manage the ear care ecosystem for effective scaling up of Shruti iHear. However, it did not want to directly build up and manage a field workforce for the program. • Medtronic was able to find a range of partners to work with in scaling-up Shruti iHear, including service delivery organizations to reach beneficiaries: Medtronic engaged with Icarusnova and Chaturvedi to develop a modified prototype best suited for use by public health workers and retained Icarusnova to help with design and oversee the manufacturing. It partnered with ClickMedix to develop Shruti’s software platform. Medtronic continues to drive the scale-up strategy, but is working with numerous service delivery NGOs, such as Dr. Shroff’s Charity Eye Hospital and Health Management Research Institute, to train health workers to use the technology and bring the service to low income communities.